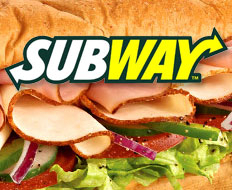 FFA - Subway reports they do not offer and have no plans for Halal specific menu in the United States or Canada. Florida Family Association sent out an email alert at midnight on May 7, 2014 which reported Islamists pressure Subway to serve only Sharia approved Halal certified meats at 200 stores in the United Kingdom. Thousands of people sent emails to top Subway officials. These emails to Subway officials stated in part: Your no ham, no bacon, Halal only menu is offensive to me and would be unacceptable to millions of other American consumers even in communities with larger Muslim populations. Please remember that Freedom is the hallmark of the American way of life. Sharia compliant food for everyone is not Freedom. In response to your question do we have plans to implement Halal into the US menu? There are currently Subway stores with a Halal menu in the UK, Ireland, Middle East and the Netherlands. There are no Subway locations in the US or Canada that offer the Halal specific menu and there are no plans on doing so. Subway’s response would have been more certain had they stated that they will “not” offer the Halal specific menu in the United States. After all their response is contingent on their current plans. Plans can change. On the other hand, Florida Family Association has received hundreds of responses from companies during the past twenty six years stating that they have “no plans to advertise” on certain shows being monitored. In every case, the companies did not advertise again on the program being monitored. Therefore, there is some comfort in Subway’s response given Florida Family Association’s experience with similar situations over many years. Florida Family Association will continue to monitor the market for policy changes being considered or made by Corporate America which seek to institutionalize Sharia in the United States. Sharia law will not come through congress or state legislatures. It will happen market piece by market piece, food retailers, banks, physicians in the policy changes that Muslims demand. It will come by law enforcement making exceptions for not enforcing the law where Sharia permits violence toward women as in the case in Tampa involving the honor killing of Fatimah Abdallah. Please do not assume that Florida Family Association knows everything that is occurring with regard to Islamization in the United States. Please forward articles and inside information regarding these events to davidcaton@floridafamily.org The values and freedom that Americans cherish are far too important to take a passive approach when dealing Islamism in the United States. Once the ground is lost to Islamist it will be very difficult to regain it.